Orvus WA Paste is a near-neutral pH, anionic synthetic surfactant and wetting agent with excellent detergency, emulsifying, and dispersing properties. 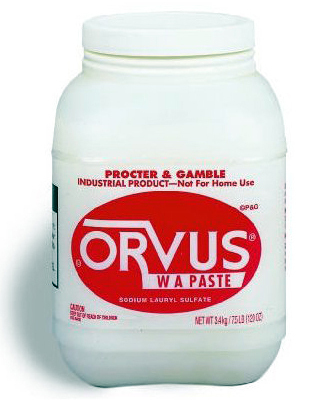 The primary component of Orvus WA Paste is sodium lauryl sulfate. It is a gentle detergent that is recommended for cleaning most fine textiles. Orvus is a neutral pH synthetic detergent with excellent detergency, emulsifying and dispersing properties. Orvus contains no phosphorus and is biodegradable. Orvus is soluble in hot or cold water and provides excellent sudsing across a wide range of water hardness conditions. Orvus lowers surface tension, providing fast wetting and penetration, and is effective in many cleaning tasks, such as cleaning rugs, upholstery and hand washing of delicate fabrics. At room temperature, Orvus is an amber colored liquid of honey-like consistency, but solidifies into a white colored soft paste form at about 55°F. For reference, use 1 to 3 ounces by weight of Orvus Paste per gallon of water for hand washing of fine fabric and up to 4 ounces per gallon for rugs and upholstery. Rinse very well in order to remove all traces of Orvus from the fabric. When using this product as with all chemicals and cleaners, always wear gloves, safety glasses and protective clothing.